Manual winch with automatic brake for safety. 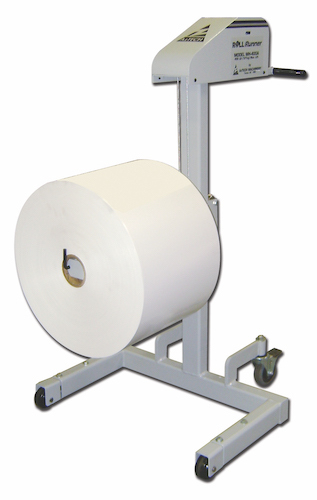 Heavy-duty casters move loads quietly and easily. Three different lifting height carts are available. Special attachments and size changes available by request. Weight capacity (lbs.) 400 lbs. Core Lift Boom with Roll Ejector Lever. Ease of movement, with handle for moving. The Core Lift Boom allows the operator to lift the roll by the core. The Roll Ejector Lever allows the operator to slide the roll off of the boom and onto the core holder with the push of his foot. Swivel Cradle Attachment. The swivel cradle supports the roll from the bottom. The cradle may be rotated 360° to help in positioning the roll for installation or removal. Maximum diameter for 360° turn 30 inch. Crating charge: Addition fee, noted when confirmation ship date. Electric option: Requires 24 series battery (not included), but does include a battery charger.